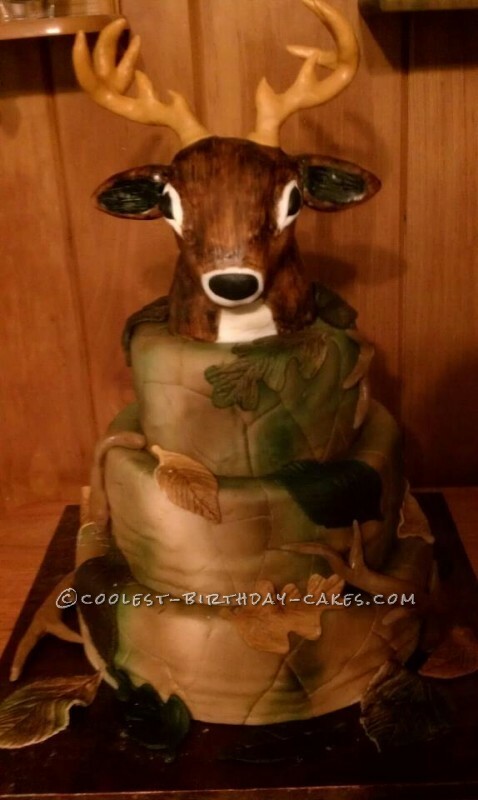 I made this Deer Hunter cake for a customer’s groom’s cake. I started by baking 2 of each: 6″, 8″ and 10″ circles. 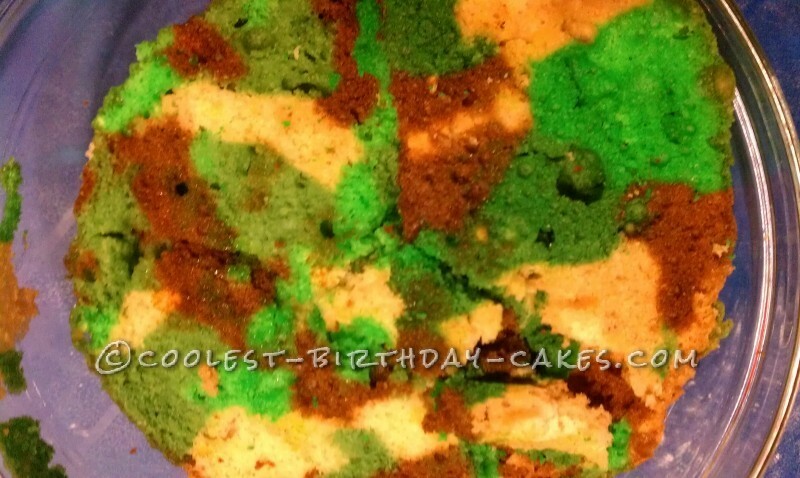 They were all vanilla cake, and I dyed most of the batter with Wilton moss green and brown (1 batch dark, 1 light) and left some white to make a camouflage effect. I covered a 14″ square wooden board with brown foil. I then made homemade marshmallow fondant and tinted it tan with Wilton brown. I covered each layer in the fondant and stacked the tiers, using plastic dowels as support. I used my airbrush machine with brown and green colors and sprayed patches here and there to create a camouflage effect on the outside. I then made the creases using a flat-edged sculpting tool. Using the same fondant, I shaped some antlers to go around the cake. I took what was left and kept some tan and tinted some with moss green and made some darker with more brown. I used leaf-shaped cookie cutters to cut out the leaves from the different colors and airbrushed them as well. The deer head was sculpted from homemade rice krispie treats and covered in white fondant. I hand painted it with Wilton brown and black. The ears are fondant and are stuck in with long toothpicks. The antlers were shaped with wire and covered in gum paste that I tinted tan with Wilton brown. The cake was a big hit at the wedding!